Last year, when Dave and I were living in Florida during his first year of residency, I came across a great Jewish food blog that I’ve been using to reference a lot of things on high holidays. 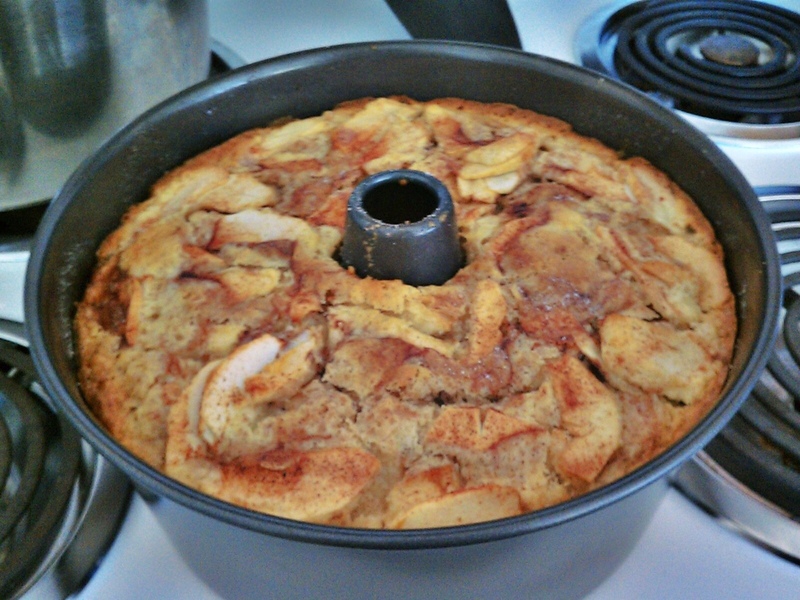 One of them was this apple cake. Since we’re back in an area where we can see our families, we are celebrating the start of Rosh Hashanah tomorrow night. Traditionally, apples and honey are used to symbolize having a “sweet new year”, as Rosh Hashanah is the Jewish New Year. Peel apples and slice thinly, mixing with 1 tbsp lemon juice in a large bowl to prevent browning. In a small bowl, mix the cinnamon sugar topping mix together by adding the cinnamon with the sugar as seen above under apples and topping. Set aside. Mix dry cake ingredients together in a large mixing bowl. In another, mix the wet ingredients together. Add the wet to the dry and beat until smooth. Pour half the batter into a greased 10 inch tube pan with a removable bottom. Sprinkle with a little less than 1/2 of the cinnamon sugar. Arrange half the apples with half of the juices, if any, then sprinkle with a little more cinnamon sugar. Repeat layer again, batter, sugar, apples, sugar. You may have some apple leftover. Be sure to cover the top layer well as the cake will separate a bit from the edges while baking. Bake at 300 degrees F for 90 minutes or longer until a toothpick comes out clean and the top is browned. Let cool completely as the juices from the apples need to be absorbed by the cake before being removed from the tube pan. *this cake actually tastes better the next day; the juices from the apples flavor the cake further. Its really delicious, and perfect for the holidays! Shana tovah u’metukah!